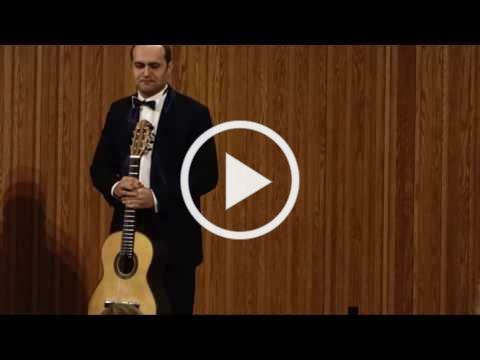 GUITAR SENSATION ROVSHAN MAMEDKULIEV IN CONCERT SATURDAY APRIL 13, 7:30 AT THE TRIANON THEATRE. DON'T MISS IT. TICKETS FOR SALE DURING OUR FINAL TWO CONCERTS AT $10 A PIECE FOR THIS QUALITY GUITAR-Winning ticket will be drawn at our May 18 concert. Winner need not be present to be eligible. OUR 2018-19 CONCERT SEASON WILL CONCLUDE ON MAY 18 WITH A PERFORMANCE BY THE OUTSTANDING DUO OF TONY HARMON AND NATHAN TOWN. CONSULT OUR WEB SITE FOR MORE INFORMATION. Once a month, except in December, the society hosts an open mic at which guitarists of all ages and abilities try out their latest efforts in a welcoming atmosphere. You can perform or just enjoy the music. It is free of charge. We meet from 7 to 9 pm at San Jose's Vineland Library at 1450 Blossom Hill Road. Lately we have been recording the open mic performances and, if the guitarist agrees, posting them on our YouTube and Facebook pages and on Instagram. Check out examples: SBGS YouTube Open Mic page. The host for the March open mic is Babak Falsafi of the San Jose School of Guitar. Falsafi is an award winning guitarist, composer, music arranger . Please join us on Tuesday, March 26. Have you considered making a contribution to the South Bay Guitar Society? We ask guitar lovers and friends to consider becoming members and to donate so that the Society can continue to present great artists and promote guitar education and performance opportunities for the next generation of guitarists in the Bay Area. Thanks. SBGS is a 501(c)(3) non-profit (federal id 77-0414012). Your membership is tax deductible. You can donate here, or mail your donation to: SBGS, P.O. Box 321269, Los Gatos, CA 95023. Does your employer provide matching donations? Please check!